Home / News / Which Timber is Best for Decking? Looking to add decking to your place? If so—you’ve made a great decision. Over the last few years, decking has become a more and more prominent feature in homes across the country. Used commonly in both outdoor and indoor areas, timber decking adds both warmth and functionality to any home in which it is installed. One of the best things about it is that it can make any yard exponentially more usable and inviting. Whether you’re looking to host more guests and have more parties at home, spend quality time with the family, or have a space to simply sit and reflect alone—timber decking enables you to do it, and do it more comfortably. So, now that you have decided to go ahead and deck your home out, this leaves a few questions to answer. Just as with anything else new you decide to educate yourself in, you want to ensure that you are getting the best knowledge and configuration to suit your needs. Not to mention, the best value for money. Today, we help to guide you through the process ahead and provide you with invaluable information that will assist you in getting the most out of your new timber deck. When it comes to the actual timber types to choose from for constructing a deck, there are many from which you can choose. The two most popular, and frankly—most reliable, are merbau decking and decking treated pine. Merbau decking is the more premium material of the two. It is extremely attractive and reddens and deepens in a very beautiful way as it ages more and more. Merbau is not only durable, but it is also a very desirable hardwood to work with. It cuts clean and fastens easily, making it one of the top choices to use for handymen and professionals everywhere. Treated pine decking is the alternative option for decking. 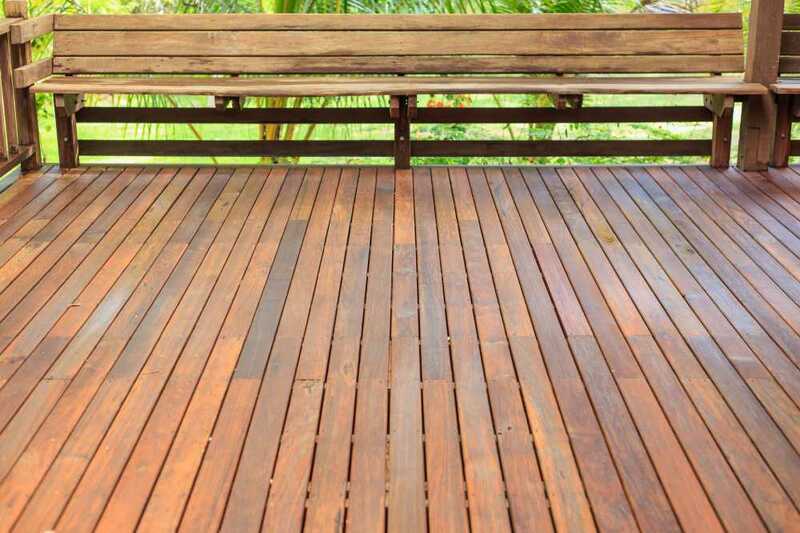 It is a decay and termite resistant timber that has proven time and time again to be the most economical choice for the construction of a deck. Extremely versatile, treated pine is a favourite of those in the industry because it can be painted or stained to match any colour scheme. Ultimately when selecting a timber type for your decking, it comes down to factors such as budget, visual preference, and application. Merbau will ultimately offer you more durability, a more unique yet less versatile finish, and a pleasurable cutting and fastening experience. Treated pine, on the other hand, will save you money in the short term, offer you a good level of durability, and provide you with a high level of versatility in terms of finish options. When it comes to constructing a deck, you might be wondering what the best timber for outdoor decking is. Well, the best timber for decking is the one that suits your property, budget and requirements. Before we go any further, it is important that you become aware of your options. Without knowing the different types of decking timber available for you to build from, you won’t be able to make the best and most informed decision. While decking timber comes available in a number of different materials, we have made the decision to manufacture and supply what we believe are two of the best. These are merbau and treated pine. As far as the best hardwood for decks goes, merbau is right up there with the greatest. Merbau is actually a hardwood that is favoured by many experienced and professional builders and carpenters. This is largely due to the fact that, even despite being a hardwood, merbau is extremely easy to work with. It cuts clean and fastens easily. Not to mention getting nails into it is a breeze, not requiring pre-drilling (unlike most other hardwoods). Merbau is usually finished in its natural colour, which is a deep red that ages nicely and increases in charm with time. On the other hand, treated pine is a great option for decking, as it is more cost effective and versatile than merbau. It is a softwood that is naturally decay and termite resistant, making it one of the more durable softwoods around. What our customers love about treated pine is that they can paint and stain it to match almost any colour scheme, allowing for a more uniform finish in their homes. How Much Does It Cost To Build A Deck Per Square Metre? A common question we are asked by our customers is how much is decking per sqm? Timber decking prices vary on several factors, including material, shape and size, and the final treatment used to preserve the wood. For example, treated pine decking prices are going to be different to merbau decking prices—and then if you treat either timber with ACQ or CCA, the price will be different again. ACQ is a more pricey preservative than CCA, changing the price of decking again. When building a deck, you will pay different prices based on the size of the timber panels you order. Custom sizes may cost you more than standard sizes, changing the project cost altogether. For accurate pricing, we recommend contacting us directly with exactly what you’re after so we can quote you for your specific requirements and project. How to Choose the Best Decking Material for Your Home? Choosing the best decking timber for your home is mostly a personal affair. Your requirements are going to be unique to anyone else’s and you will need to choose decking timber that suits your taste, your property and how much you’re willing to spend on building a deck. We recommend that you take your time feeling your way through material and selecting the one that feels right. If you want help choosing, feel free to contact a timber specialist from our team today on 03 9305 2000. They will be happy to assist you in selecting the best timber material solution for your needs. What is the Best Timber For Outdoor Use? Choosing timber for outdoor use is as personal as choosing decking material for your home. Again, you will need to size up your requirements and how much you want to spend. Another key factor is what specifically you are using the timber for. There are many different applications for timber outdoors, and each may call for a different type. How Long Will Treated Pine Decking Last? While hardwoods are known to be more durable than softwoods, treated pine decking that is preserved correctly and treated in the best way possible can last for around 15 to 20 years. The cost of timber decking will depend on a few different variables. Merbau and treated pine differ in price, with merabu costing slightly more. A 70x22mm plank of treated pine decking, in a 0.900m length will cost around $2.21l; while a plank of merbau in 70x19mm, at the length of 0.900mm, will cost roughly $3.47. The next factor that affects cost is the size of your proposed deck. Of course, the average cost of building a deck is ultimately going to depend on how big the deck in question is! Finally, as decking timber planks are available in a wide variety of specifications; the specific sizing selected will play a big role in determining the cost of your deck. Timber decking is now available from a number of manufacturers and stores—many of which offer good service and an excellent product. Here, at ATP, we endeavour everyday to be one of the best manufacturers and suppliers of timber decking in the country. Whether you want to visit us in person or simply buy decking online—we’ve got you covered. If you are ready to invest in timber decking, pick up the phone and call 03 9305 2000 today. Our team has over 25 years of expertise in all things timber and have a passion for creating the best decking solutions for our clients. « What Does Dressed Timber Mean? Such a great site this is very helpful and informative. What an informative and helpful article. I can definitely use this for future. Great read! I ove how informative this blogpost. What an informative and helpful blogpost I can definitely use this for the future. This was really a good article. there are things that I can use for future reference. What a great read. I learned something new that can be really useful for future. One of the posts I have read today. This could be a big help to me. This was really a great post to remember. love the topic.